One of over 100 floating memorials and museums located throughout the United States that serve to commemorate and showcase American pride and naval ingenuity, the USS Midway, berthed in San Diego, California, the lead ship of its Midway class, was once the largest ship in the entire world. The air craft carrier’s exemplary maritime service is a model of dedication to duty as well as country. 968 feet in length, with a beam of 113 feet and a draft of 35 feet, Midway’s original displacement was an impressive 45 thousand tons with a speed of 33 knots or nearly 40 mph. The aircraft carrier also originally included an armament of 18 five-inch guns, 84 40 mm guns, and 68 20 mm guns. The ship could sustain a crew surpassing four thousand. Midway represents the lead of the Midway class ships, along with USS Coral Sea and USS Franklin D. Roosevelt. This class of ships is not only distinguished by their size, but also by their ability to accommodate more planes, 137, than any other carriers. In addition, Midway class ships maintained their strength deck at the hangar deck level rather than on the flight deck of the ship, allowing for an armored flight deck to be included as part of the ship’s superstructure. Commissioned from September 10, 1945, to April 11, 1992, USS Midway enjoyed nearly half a century of active military duty service beginning in Norfolk, Virginia. The carrier participated in eleven different naval operations during the course of its impressive career: Operations Frostbite, Sandy, Grand Slam, Rendevous, Frequent Wind, Ernest Will, Classic Resolve, Imminent Thunder, Desert Shield, Desert Storm, and Fiery Vigil. For the ship’s efforts to protect and defend American interests at sea, Midway was distinguished by several meritorious achievement awards and accolades. Some of these awards included three Navy Unit Commendation Medals, four Battle Efficiency Ribbons, three Armed Forces Expeditionary Medals, a Navy and Marine Corps Expeditionary Medal, two Meritorious Unit Commendations, a Humanitarian Service Medal, a China Service Medal, and a Presidential Unit Citation. In addition, Midway served as flagship for six different task force divisions, including Carrier Division 1, COMCARDIV 6, Carrier Division 4, COMCARDIV 3, COMCARDIV 5, and Commander Task Force 154. Today many sailors design US Navy Rings to commemorate their service on USS Carriers and ships. Throughout her long maritime history the Midway became synonymous with U.S. naval advancement. It was the first aircraft carrier to utilize a helicopter for plane guard duty. Also, it was the vessel from which the first successful rocket fired from a moving platform at sea was performed. The ship also received the largest aviation crane ever installed on an aircraft carrier. At one point of time, Midway also received the most extensive and most complex modernization in terms of capabilities upgrades that had ever been seen on a naval vessel, and the first completely successful conversion of an aviation fueling system was performed onboard the carrier. Additionally, Midway represented the first forward foreign deployment of a complete carrier task group for nearly two decades of service in Japan, was the first carrier to visit Sydney, Australia after 1972, and was the first Navy carrier to dock pier side in Fremantle, Australia. View the beautiful military swords designed for all nave personnel. During the Persian Gulf War, Midway was the first aircraft carrier to conduct operations for prolonged amounts of time in the Persian Gulf and was also the first to receive a port call in the region. 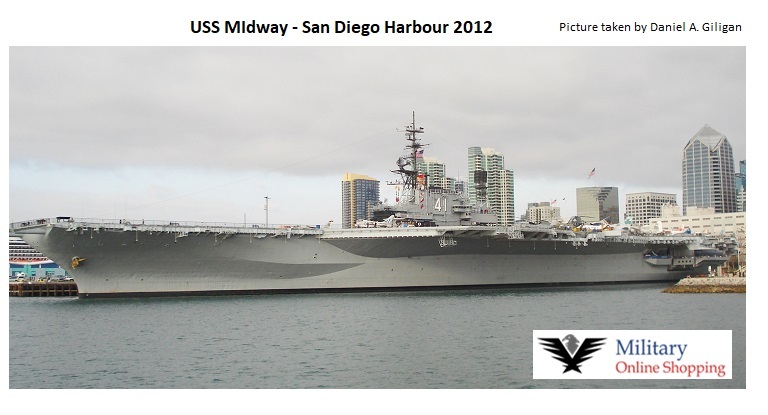 Today the USS Midway continues to serve as a floating memorial and museum. A living symbol of American maritime pride and naval ingenuity dedicated to the American public and the thousands of mariners who served aboard the aircraft carrier during its years of active duty service with the U.S. Navy. Docked in San Diego, California. The USS Midway eminently showcases both history as well as innovation, might as well as magic, pride as well as perseverance, and a is a treasure for the entire nation.